Good hiking with great views on Cvrsnica Mountain and Blidinje lake to the east, Ljubusa and Duvanjsko field to the west, and Radusa in the northwest. The trail crosses the mountain ridge from Mali (Little) Vran to Vran and descends to Blidinje lake where a mountain hut is located, then continues towards monastery Masna Luka. There is also an alternative via Great Vran summit. The trail starts in the pine forests on the southern slopes of Vran. There are few private properties and holiday houses, and some of them are available for rent or camping nearby. The walk through the forest is nice and pleasant. From Omrcenica, the ascent to Mali Vran starts, which is not long but is a bit steep. After Mali Vran, the trail follows a wide ridge with splendid views on Blidinje and Cvrsnica. The ridge hiking ends on Vran summit and from there descends over steep terrain down to the Mountain Lodge Blidinje on the shore of the lake. The descent is pretty steep and hard on the knees. There are also alternatives continuing towards Veliki (Great) Vran summit for another 2 hours with descend down to Hajducke Vrleti mountain hotel where great food is served. From Veliki Vran the trail continues even further over less steep terrain. If you opt for alternatives, you have a chance to visit Stecci necropolis in Dugo polje, one of those on UNESCO haritage list. From Blidinje lake the trail continues across the field and ends in Masna Luka where a Franciscan Monastery is located. 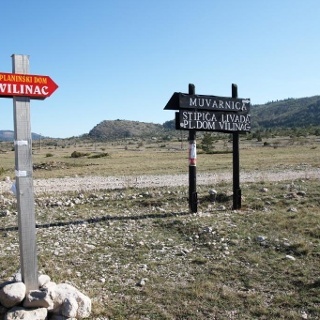 If undertaking the complete Via Dinarica hike, plan your overnight at Omar or Omrcenica. You can arrange camping or staying in holiday houses with locals from Omolje or Mandino villages. Check the contacts provided in accomodation! Be aware of the thunder and lightning storms. 112 emeregency number, also for Mountain Rescue Service. Watch out for deep pits close by the trail! Turning off the road will be to the left, uphill. At the ridge beneath Mali Vran, turn right towards the summit (other trail goes down toward the holiday house). From here just follow the blazings all the way to the summit of Vran. At Vran turn right down and descend to the local road which will bring you to the lodge. The trail actually continues across the field to Boricavac settlement and there you look for the trail dividing left from the main track. Drive from Tomislavgrad to Blidinje Nature Park and stop soon after pass at Svinjacha. Posible when you turn onto the gravel road. Divna tura, staza potpuno obilježena i vidljiva. Nemaa vode za piće. Preporučujem Noćenje na Omrčenici kod Stipe Vukadina (PD "Orlova stina") koji nas je ljubazno vodio ovom turom. In Omercenica there is a lovely accommodation, "Anastasia". Ask for Stipe Vukadin, he is the owner. Even though it's being renovated, mountain hut Blidinje is nice, it even has got showers. When closed the bbq area is a good place for bivouac. The hike down from Vran is a bit mean on the knees.